Most of the pattern prints used in this patchwork are furnishing fabrics and date from the 1930s and 1940s. The patterns include a variety of bold floral and novelty prints. 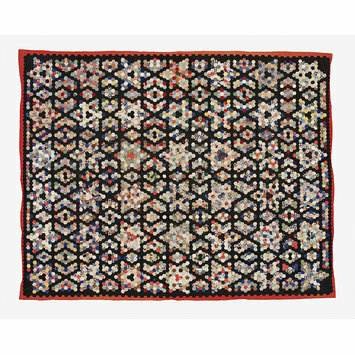 Griselda Lewis created this coverlet after the Second World War, when fabrics were in short supply, and its materials are a snapshot of her life at the time. The coverlet also testifies to the maker's ingenuity in terms of both materials and design. The black fabric is recycled from her blackout curtain, while some of the cottons are from swatches sent to a family friend at House & Garden magazine. The main bulk of the hexagons were cut from old dresses and shirts. The reverse is believed to be cotton used for Red Cross famine-relief parcels which she acquired from an army-surplus store. The quilt took between two and three years to complete, and was worked on mainly in the evenings. This was the only patchwork coverlet she ever made. Patchwork coverlet of printed cottons and heavy blackout cotton. Most of the patterned textiles are furnishing fabrics and date from the 1930s and 1940s. The patterns include a variety of bold floral and novelty prints. It is pieced in a hexagon design of the maker's own creation; a repeat of 6-pointed stars interspersed with rhombus shapes and chevron shapes. Each star has been created from 54 hexagons. Lined in red cotton sateen. 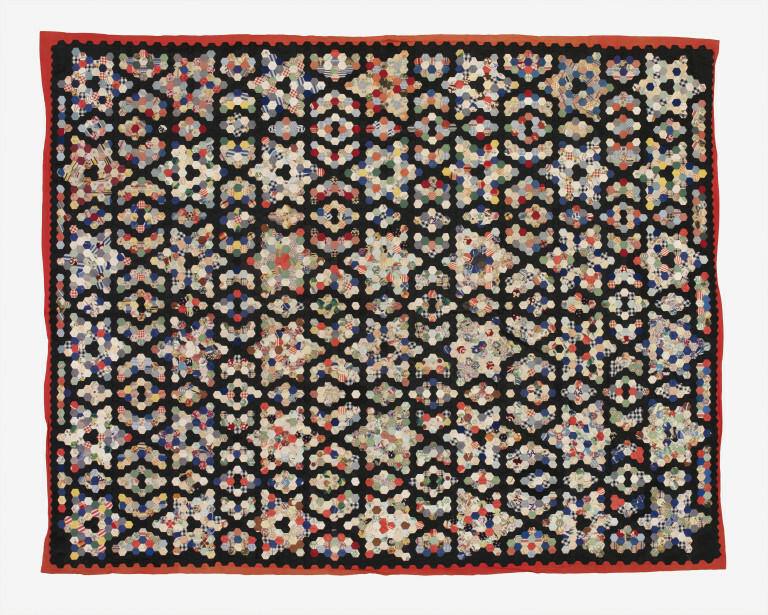 The maker of this coverlet, Griselda Lewis, was the editor of The Handbook of Crafts (1960). Some of the patterned furnishing fabrics were taken from swatches sent to Robert Harling, the Editor of House & Garden for 28 years, who lived nearby in Wiston by Nayland, Suffolk. However most of the hexagons were cut from old dresses and shirts and black out material used during WWII. Blackout material was sold by the Civil Services Store (part of the Civil Services Association). It may have been manufacutured by the York firm of Hunter & Smallpage. Bed cover, printed cotton patchwork, Griselda Lewis, Essex, 1945-1950.